Ten Pin bowling was a pastime at antebellum Troupville, Georgia. A brief legal notice which appeared in the April 2, 1852 edition of the Albany Patriot indicates that one of the “worldly amusements” available at Troupville was a ten pin alley, or bowling alley, operated by Daniel W. Thomas before his death. 1852 administration of the estate of Daniel W. Thomas, Troupville, GA. Lot of Land No. ninety-one (91) in the 12th dist. of originally Irwin now Lowndes county, containing 410 acres more or less. Also Town lot No. 17 containing one-fourth of an acre, well improved, with a Ten Pin Alley on said lot. 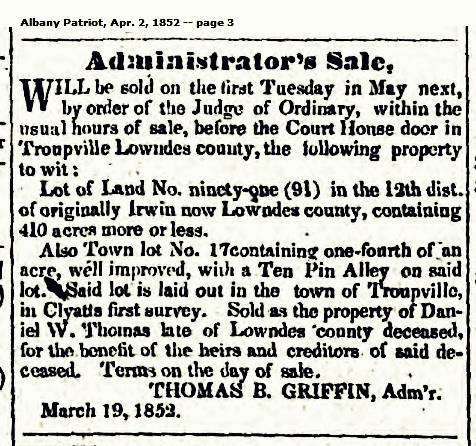 Said lot is laid out in the town of Troupville, in Clyatts first survey. Sold as the property of Daniel W. Thomas late of Lowndes county deceased, for the benefit the benefit of the heirs and creditors of said deceased. Terms on the day of sale. Daniel W. Thomas (1820-1851) originated from Connecticut, but came to Troupville, Georgia some time before 1847. He was a shopkeeper and a bachelor , residing in a Troupville hotel owned by George W. Stansell. A Democrat in politics, he was elected as one of three Lowndes county representatives to the 1847 gubernatorial convention. 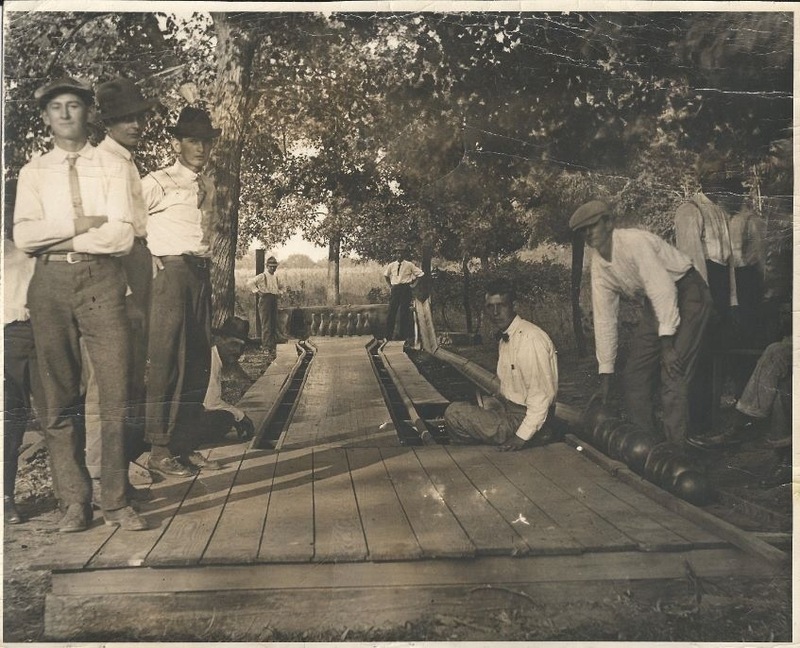 The Ten Pin Alley at Troupville, GA may have resembled this early example from Eudora, KS. Image courtesy of Eudora Area Historical Society. The 1870 Tax Digest of Lowndes County, GA indicates that S. B. Lester operated a ten-pin alley and a billiard table in the 663 Georgia Militia District. On June 25, 1912, The Valdosta Times reported on some of the first cotton blooms of the season. 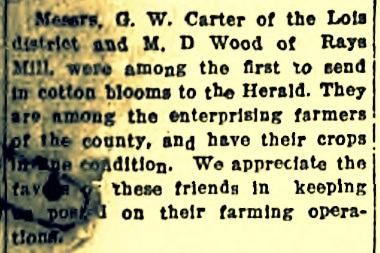 The growers were G. W. Carter, of Lois, and Milledge Dewey Wood, of Ray City, GA.
Messrs. G. W. Carter of the Lois District and M. D. Wood of Rays Mill, were among the first to send in cotton blooms to the Herald. They are among the enterprising farmers of the county, and have their crops in fine condition. We appreciate the favor of these friends in keeping us posted on their farming operations. 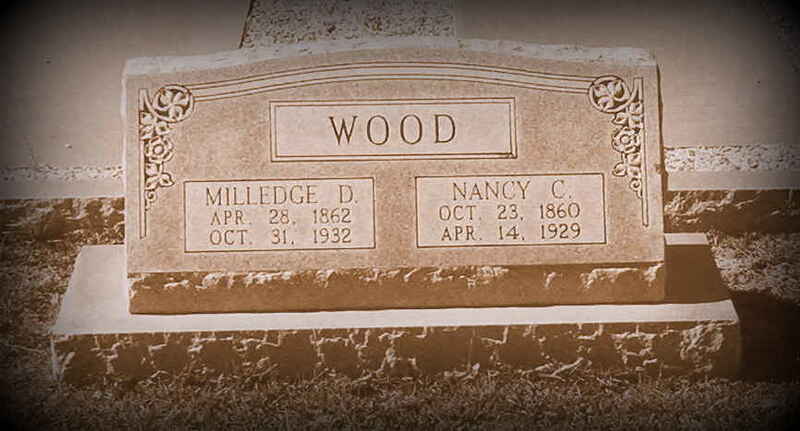 Milledge Dewey Wood was the father of George W. Wood and father-in-law of Creasy Brown Wood, subject of previous posts (see Creasy Brown Wood buried at Dupont, GA). 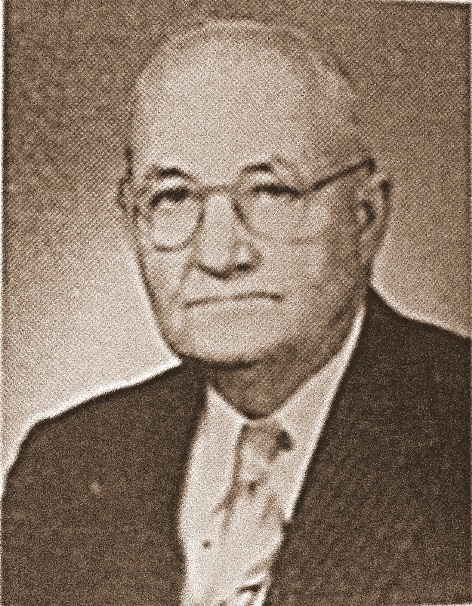 M. D. Wood was a son of Josiah Wood and Caroline Meeks. His gravemarker gives his birth date April 28, 1862, but from census records it appears that he was actually born in 1860. At the time of his birth, his father, Josiah Wood, was farming in Macon County, GA near the town of Lanier. But with the outbreak of the Civil War, his father joined Company E of the 4th Georgia Cavalry. Josiah Wood did not serve long in the Confederate States Army. Due to a disability he was discharged after just one year of service. Some time before 1870, young Milledge moved with his family to Coffee County, GA, where his father farmed a small place valued at $200. The 1880 census record for M. D. Wood has not been located, but in 1883 he married Nancy Caroline Rhoden. In 1900, the couple made their home in Dupont, GA where Milledge owned farm free and clear of mortgage. By 1910 the Nancy and M. D. Wood had moved their family to Georgia Militia District 1329, the Connells Mill district, near Ray City, GA. Wood rented a farm on the Rays Mill-Cat Creek road, next door to farms of Lacy Lester Shaw and Francis Marion Shaw. 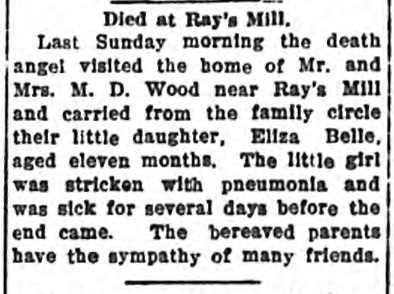 In 1920, Wood was farming a place outside of Ray City, on the Nashville Road. On the farm next door was Gideon Gaskins.